The State Government has failed to address the grievances of the affected people and had given the facts of which all the general public are quite aware off and some of the facts are incorrectly stated. That the height of the dam is 66 meters and the length is 1074 meters. The submergence area by the dam reservoir is estimated to 1215 hectors. And the statement that almost all the submergence area lays in Ukhrul District is wrong because some portion of the Senapati District is also included. As we all know that the main objective of these dam is to impound water for irrigation of 17500 of cultivable land and creation of annual irrigation potential of 26500 hectors with three crops in the valley Districts of Thoubal, Imphal West and East area and the project is to supply 10 MGD of drinking water and it will generate electricity power to extent of 7.5 MW. The people of this affected and displaced of this dam and the Government of Manipur have started clashes in early part of 1980s. The IFC the Government of Manipur could not acquire this area because the land belongs to the tribal peoples of which the constitution of India gave special protection to the Tribal”s land. After several rounds of talks with the so called one organization the Mapithel Dam Thoubal River Valley Multi-purpose Project Affected Village Committee finally entered a memorandum of agreed terms. But the IFC Government of Manipur paid the land compensation to the land owners in the piece meal. In eight years time, 7 times installment at total of 86% was paid which is against the agreed terms and the people of these area cannot used the money for any purpose, for this reason, on the 3rd September 2003 a general body meeting was organized by Mapithel Dam Thoubal River Valley Multi-purpose Project Affected Villages at Thawai Village Ukhrul District. The meeting resolved to reject the offer for final payment of land compensation until and unless the memorandum of agreed terms. But surprisingly one organization called Mapithel Dam Affected Villages Organization came up in the same area and started chaos and disturbance and overtook the present organization and MDAVO members of the area quietly took away the remaining 14% from IFC in between 2004-2006 Thawai, Riha and Ramrei villages in 2008 and Lamlai Mongbung in 2009 took away their Rehabilitation and Resettlement package after taking away their final land compensation and Rehabilitation and Resettlement package breaking the 3rd September 2003 resolution as it went against it and their right for claim has already been forfeited as they have already taken the entire amount. After prolonged monitoring, the so called MDAVO and their impossible demands i.e To construct over bridge at Mapithel Dam in between Thawai and Riha village to eastern Mapithel hill for which will incur in terms of crores in other words that is equivalent with the total amount of the Dam construction expenditure. And also they demanded for Rehabilitation & Resettlement Grant including some villages which are not in the submerged Area. That in fact, in the original order issued by the competent authority/ under secretary (IFC) Government of Manipur wide order dated 6-10-1990. The competent authority had decided for payment of Rehabilitation Grant only for the villages namely;¬¬- 1. 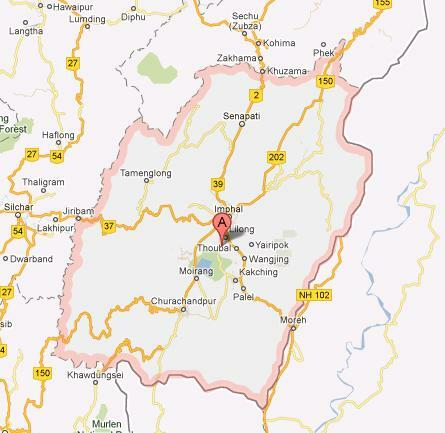 Phayang in Imphal District, 2 Louphong village, 3 Chadong village,4 Lamlai Khullen village, 5, Lamlai khunou village and Lamlai Mongbung village in Ukhrul District respectively. In the said order, the name of Riha and Thawai village are not included. That it may also be important to mention here that beside the aforesaid order dated 16/10/1990 there is also another important agreement which was made on 19/6/1993 in which the headman of the Thawai and Riha villages and also the representative of the said villages were very much present namely, N.G Khating, Headman of Thawai village, M.H Mayosing, Headman of Riha village. In the said agreement it is clearly mentioned that the Rehabilitation and Resettlement Programme/Package were not included for the said 2(two) villages meaning thereby their villages are not displaced and likely to be submerged by the said Proposed Dam and no Resettlement & Rehabilitation Package will be allowed for the said 2(two) villages. However by a joint application dated 24/10/2009 signed by the 3(three) persons namely;- 1) M.H Wungreishang, Headman Riha Village, 2) Kapangmi Jajo, Chairman, Riha Village Council, 3) R. George Akar, Secretary Riha Village Council have preferred to the Commissioner (IFC), Government of Manipur & the Chief Engineer (IFCD), Government of Manipur thereby requesting for grant of Rehabilitation and Resettlement grants to Riha village, Ukhrul by enclosing a resolution adopted on 24/10/2009 by the villagers of Riha Village. The agreement dated 19/6/1993 along with joint applications dated 24/10/2009 preferred by the headman, chairman and secretary of Riha Village Council along with the resolution dated 24/10/2009 and another similar joint application dated 14/11/2009 preferred by the secretary, chairman and headman of the Thawai village council along with resolution dated 24/10/2009 and reminder letter dated 17/3/2011 preferred by Secretary, MDAVO. The said true copy resolution is available with us and IFC government of Manipur. And intentions of the said MDAVO leader of Chadong village is to take double benefits from the competent authority by using illegal means for showing two different villages of Chadong and Riha by manipulating the names of the villagers by giving false assurance to the innocent villagers that they will get double benefits one in the name of Chadong village and another in the name of Riha village. Thereafter some part of Riha village is now occupied by the said writ petitioner 211 of 2012 Guwahati High Court by constructing a school in the name of United Christian Academy and also by making some houses so as to enable them to claim for double compensation. When this particular fact came to knowledge to the competent authority, the competent authority have themselves rejected their claim and the present agreement dated 24/9/2011 were executed and such as the claim of the MDAVO were not considered by the competent authority. The so called MDAVO always mention regarding ERC (Expert Review Committee) is not a decision making authority, it is only a guideline body. Only Cabinet is the decision making body such as the claim of the Chairman is not tenable in the eyes of law. The MDAVO Chairman had mention that the Thoubal Mapithel Dam Multi-purpose Project Displaced Committee was formed in Tampha Hotel Imphal without the concern of the people which the statement is baseless. The meeting was organized at Conference Hall Hotel Tampha for which the villagers of Chadong and Lamlai Khunou including Government Employee/Business person working at Imphal, Senapati, Ukhrul, Chandel and Tamenglong District for Security Reason. Their Organization first started from Nagaram Imphal by naming Mapithel Valley People’s Forum in the early part of April 2003 later changed MDAVO. Please do not befool the general public. The said MDAVO is interfering into the affairs of the present undersigned organization as 50% of said Chadong Village had already been submerged into water and the same will be totally submerged by the end of March 2013 due to the construction of the said dam. In this regard, there is no possibility for shifting to a new Village site without the monetary benefits and also land compensation to be obtained from the state Government. Now there is no possibility to go together with the MDAVO and as such the R.R Programme which is entitled to the Chadong Village and Lamlai Khunou Village may be allowed to settle with the competent Authority of State Government, without any restrictions. Moreover, the MDAVO have a hidden motive to submerge the said two villages namely Chadong Village and Lamlai Khunou Village into the water and thereafter by utilizing the said difficult position of the said villages, they wanted to have a discussion with the competent so as to get their personal sympathy and personal gain on the ground of such submerging the villages into water. Advisor and convener of MDAVO Thanmi Kashung & Honreikhui Kashung of Chadong befooled the neighbouring villagers that do not cover under submerged area but only to get votes for ADC & MLA election. The Chadong Village & Lamlai Khunou Village are the only villages which are going to be the victims who have not received compensation and R.R Package. of these villages that has anything to do with the result of 1993? Is the disturbance and resentment to these two villages because, of the R&R Programme? One should keep in mind in this 21st century of Republic and democratic situation a leader can never be authoritative; should never take law into his own hands. And a good leader thinks before he gives or makes any statements. It will do a big favour for everyone you serve if you diligently take up your responsibility as a good leader and not spoil your image just to fill your empty pocket. Chadong villages R & R programme cannot be finalized till date due to the demands on the part of the MDAVO for consideration of their terms and references and training of new Rehabilitation and the resettlement policy. It is also further mention that the plugging of the Thoubal River was settled to be started in Oct, 2011 to meet the targeted completion date of the project by March, 2012 and accordingly all the Six villages will have to be submerged. However, due to long economic blockade called by the Sadar Hills District Demand Committee for 120 days, the said Dam cannot be commission on time but the 4 (four) villages have already been shifted to new areas and only remaining village are Lamlai Khunou and Chadong villages and accordingly the commissioner IFC Government of Manipur have directed the chief engineer IFCD Manipur to contact the villages of Lamlai khunou and Chadong to finalize the physical Rehabilitation Packed and early date in accordingly the new organization has been form in the name installed of Mapithel Dam Multipurpose Project Displaced Villages Committee and have enter after several round of talk and have enter into the agreement on 24-9-2011 and the State cabinet had also approved. And the another reason as to why the organization is so much against the R & R programme of these two villages Chadong and Lamlai khunou is that they too want to get the R & R programme benefits which is not included in 1993 agreement, if not there is no other valid reason why they should be hindrance to the most victim people to get the benefit when their entire village is about to be submerged by water.